Uffizi: to someone knowing a little Italian, the same word Uffizi could already reveal the very first destination of this building. Uffizi is in fact an ancient way of saying in Italian "Uffici" which could be translated with the English word "Offices". Well, here is the solution to the "mystery": when, round 1560, Cosimo I de' Medici asked his favourite architect Giorgio Vasari to project a "Palazzo", a building, next to Palazzo della Signoria, where the Duke lived, it was actually to house the thirteen Florentine "Magistrature", the administrative and judicial offices of the Duchy of Tuscany. That was indeed an immense project and works went on for a long time. All the area nowadays occupied by the U-shaped Uffizi Palace was totally transformed: many houses all around the area were destroyed and even the Church of San Pier Scheraggio, an ancient Romanesque church dating back to the 11th century, was in part destroyed, in part "closed" inside the new building. When Giorgio Vasari passed away in 1574, the project was not finished yet and other two architects, Bernardo Buontalenti and Alfonso Parigi the Elder, completed the Uffizi round 1580. 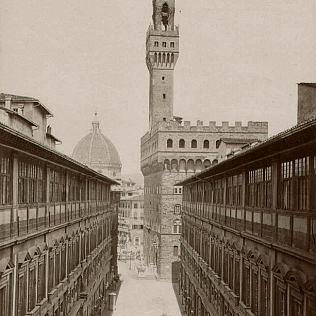 Some years earlier, in 1565, on the occasion of the marriage between Francesco I, son of Cosimo I, and Joanna of Austria, Giorgio Vasari had projected an incredible aerial passage way which took his name, the Vasari Corridor: a long corridor connecting Palazzo della Signoria and Palazzo Pitti (which had just been acquired by the Medici family), passing through the Uffizi and over the Ponte Vecchio. The official opening of the Uffizi as a gallery was in 1769, but already in 1591, on request, it was possible to see the marvellous paintings, precious objects and ancient statues which were part of the amazing collection belonging to the Medici family. Nowadays the Uffizi Gallery is undoubtedly one of the most admired and visited museums all over the world.